Standardized tests. It’s hard nowadays to think about education without them—they’ve become the metric, the substance, the rationale for schooling. We use them to identify success and failure, to tell us which schools to shut down, which teachers to fire, and which students to let graduate. I think it’s safe to say standardized tests carry more weight today than literally any other aspect of our education system. Those problems come from a few different sources, according to his account. First are the scorers themselves, whom he described as “a motley crew of temporary employees earning low hourly wages…while many of those people are earnest and conscientious employees, many others are not.” He goes on to tell a number of recollections about the folks he’s worked with at test-scoring centers, many of whom only take the jobs because they can’t get real employment elsewhere. From those who come in and leave drunk to those who clearly don’t care what they’re doing (he tells one story of a scorer who gave every student response the score of two one day just for the hell of it), he does not paint a flattering picture of the folks we are allowing to shape the futures of students, teachers, and schools. I understand that the bigger-picture critiques being adopted by many educators and community members across the country do not resonate with everyone. For me, standardized tests are dangerous because I don’t think they can actually measure a student’s ability to think, to be a critical learner, to work well with others, to have emotional intelligence—in short, all the things that actually matter in life and that one would hope an adequate education would provide. But for those readers who don’t share this pedagogical perspective, I hope Farley’s nuts-and-bolts condemnation means something. After all, he was behind the curtain. If my own experience in food retail taught me anything, it’s that when a waiter tells you not to get a particular item on the menu, it’s a big mistake to get that item. And it’d be an even bigger mistake to base your education system around it. For those seriously working to challenge the abuses of standardized testing, this is potentially powerful information. Would you identify the specific source of Farley’s report–where you read it, who published it and when, etc.? Has Farley gone on public record with his assessment, or was this some kind of private correspondence? 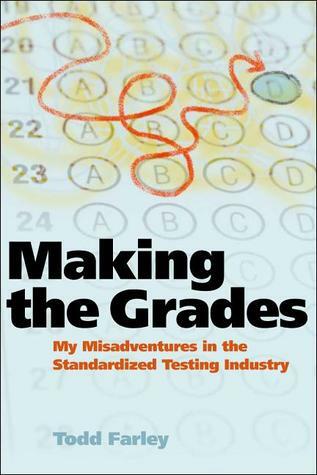 The name of the book is “Making the Grade: My Misadventures in the Standardized Testing Industry”. It’s a published book (you can google the title and find it easily) and I agree that it needs to get more attention! Amen brother! this is the truth. I have had many successe s and failures alike on standardized tests. One year i had 100% pass. The next year 77%. these tests do not measure anything…except a set of specific content based problems. Great blog. What are some of the most effective ways to swell this tide of discontent into a transformative movement against test-dominated school environments? What can help make local storms, like this book or a column, into a typhoon of movement? I think this post hits upon a good point about how schools work… The focus, instead of being on the student, is currently on tests and test scores most of the time. Your post points out how unreliable a measure of understanding these test are, along with the unnecessary pressure they bring. I especially loved the metaphor at the end. Why, if all accurate knowledge says to do otherwise, do we continue to hinge key parts of our education on these tests?